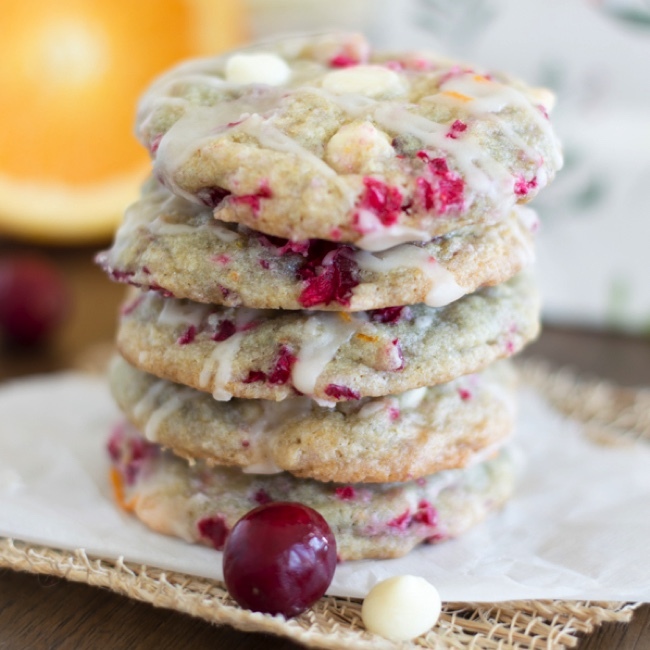 Sweet white chocolate combines with tart fresh cranberries in this festive cookie! 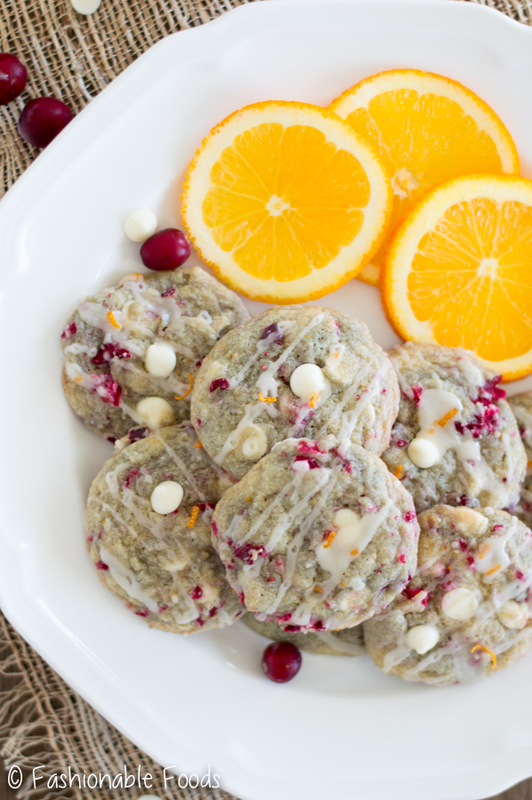 White chocolate cranberry cookies will become your new favorite cookie, especially when drizzled with a sweet orange glaze. What is an acceptable amount of cookies to eat in one day? I’m 99.9% sure I’m exceeding an acceptable amount each and every day. ? A detox is going to have to happen very soon. 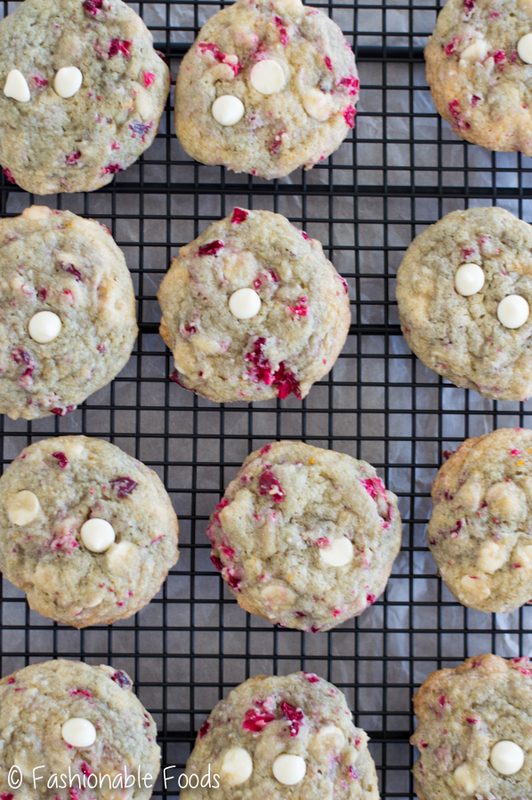 But not until I share these white chocolate cranberry cookies with you… and maybe one other cookie next week. What can I say? I’m really into cookies this year! Plus, one can never have too many cookies… Especially when they are so festive! This may be hard to believe, but there was a year where I made SO many cookies that I never wanted to see another cookie again. That was at least 5+ years ago and I’m just now getting back into cookie baking. The actual cookies weren’t the problem, it was the process of making them. I used to always put off making them until the last minute, which meant a lot of work and then being completely inundated with cookies. Cookie dough freezes beautifully, which means I can make a batch and freeze, and then do the same thing a couple days later. THEN, when it’s Christmas and I need cookies, I just pull out what I need and bake! Genius! Although all of you clever folks have probably been doing this for years, the thought never crossed my mind. Glad I’m on that bandwagon now! Excuse me while I wipe the drool from my mouth. Better yet, I’ll just go get a few from my freezer stash and bake ’em! Back in the day, I used to love making a cookie similar to this, but with dried cranberries. 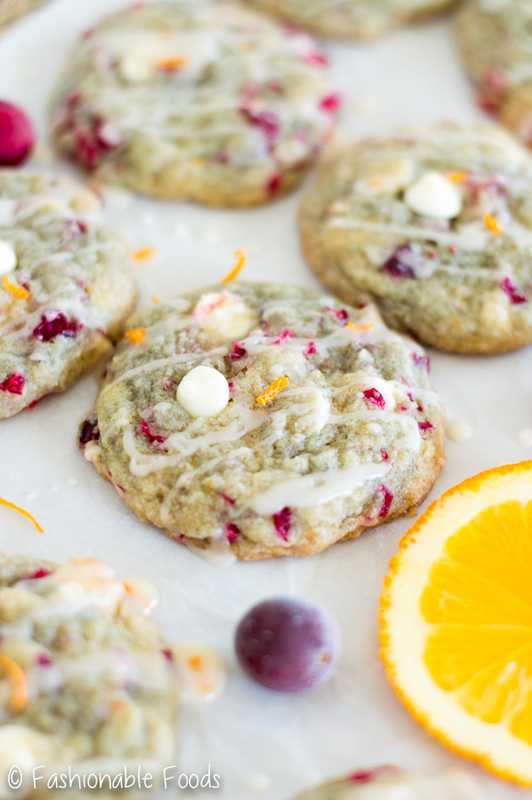 However, due to my recent fresh cranberry obsession, I knew I had to work them into a cookie. Think about it.. sweet cookies with a tart component? YES. Plus, an orange glaze? YES AGAIN. 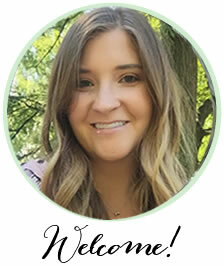 If you’re tired of the ‘ole chocolate chip cookie, or perhaps you’re allergic to chocolate (Cheyanne, I’m lookin’ at you! )… then this is your cookie! Although these cookies look (and taste) mighty fancy, they aren’t complicated to make. The dough is essentially the same as my chocolate chip cookies, but with a few tweaks. First up is the sugar ratio. 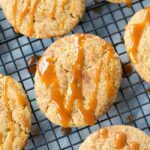 I typically use more brown sugar than white in most of my cookies because it reduces spreading, plus creates a softer, chewy texture. However, I reversed that ratio for this recipe and used more white sugar than brown. Reason being flavor and color – I felt the brown sugar would overpower the other flavors we have going on. Since there is more white sugar than brown, I reduced the baking soda to ¾ teaspoon (as opposed to 1 teaspoon in my chocolate chip recipe). Sounds like a minor difference, but it keeps the cookies from spreading too much since we have more white sugar. Obviously the biggest difference between these cookies and my chocolate chip cookies is the add-ins. 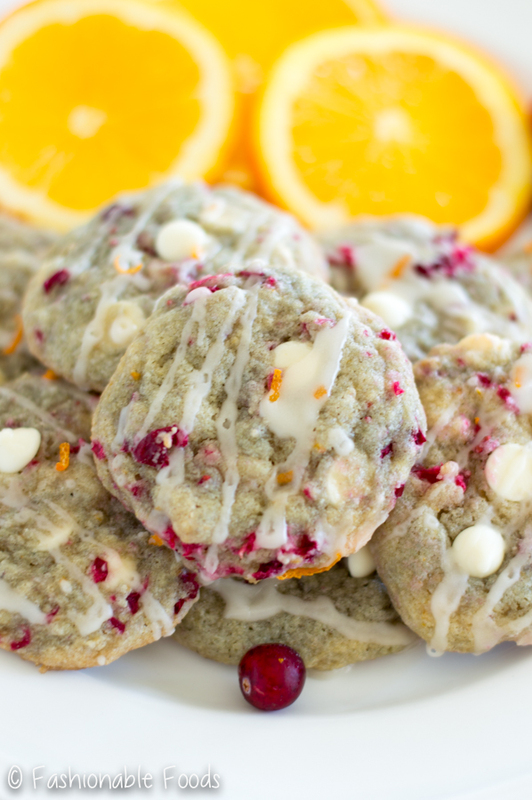 White chocolate chips, fresh cranberries, and orange zest. <– Winning combo right there. Seriously, cranberry and orange are a match made in heaven! 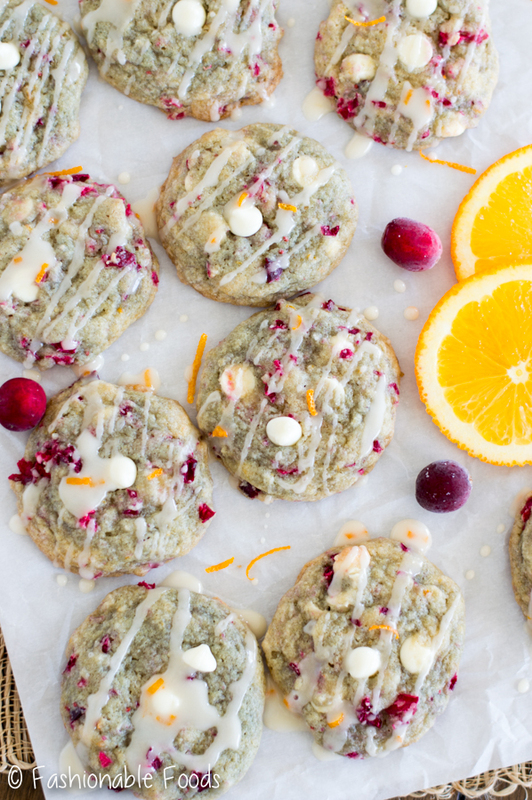 Plus, these cookies just scream Christmas! Not only is the cookie dough flavored with orange, but the glaze is too. 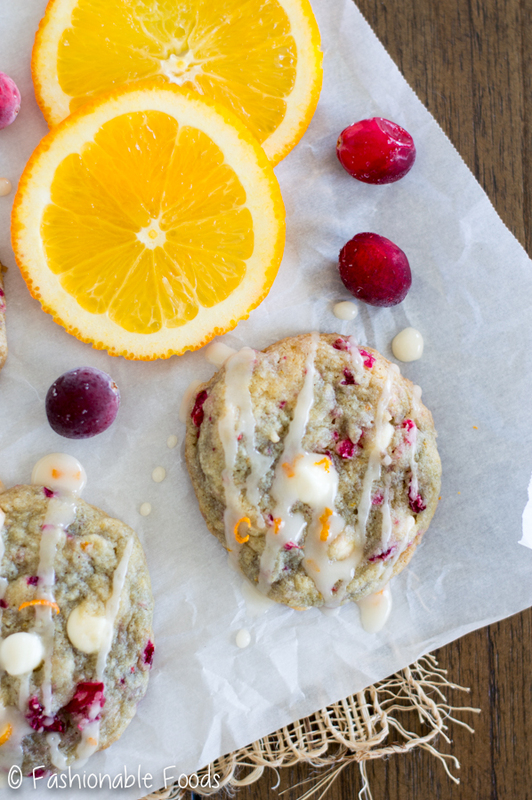 Because the cranberries lend a tart flavor, the drizzle of orange glaze is perfect. I insisted Kyle taste test one with and one without glaze and he preferred the glazed cookie (as did I). So, definitely don’t skimp out on the glaze! Chilling is absolutely necessary. Don’t skip it! Cold dough spreads much less than room temperature dough. We also want the flour to have adequate time to absorb the moisture – this is especially true for gluten-free baking. You end up with softer, chewier cookies.. instead of crumbly, flat cookies. CHILL! To get the cranberries more “bite-size”, you’ll want to pulse them a few times in the food processor. Then, be sure to drain off any excess moisture on paper towels. As mentioned before, you can freeze the dough. I recommend portioning out the dough into balls using a cookie scoop. Place them on a baking sheet and then into the freezer. Once they are frozen solid, you can transfer them to a freezer bag. Now you can have cookies whenever the mood strikes! ? Have a fabulous weekend… hopefully you’ll be baking some cookies! Kyle and I will be DIY-ing our backsplash, so I’m sure I’ll have a good story or two for you on Monday. ? In a medium bowl, combine the flour, milk powder (if using), baking soda, and salt. Whisk together and set aside. In a large bowl, whisk together the slightly melted butter with the sugars until just combined. Whisk in the egg, egg yolk, vanilla extract, and orange zest. Only mix until the ingredients come together – don’t over mix! In three additions, fold in the dry ingredients. Again making sure not to over mix! Fold in the white chocolate chips and chopped fresh cranberries. 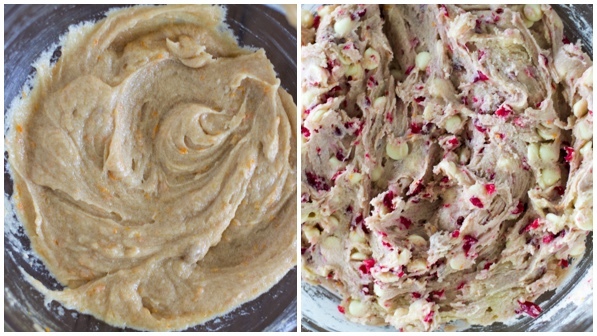 Your dough will take on a pinkish hue. Chill the dough for 2 hours in the refrigerator. Using a medium-sized cookie scoop, scoop out balls of dough onto cookie sheets lined with parchment or silpats, placing the balls about 1 ½ inches apart. Bake the cookies for 14-16 minutes, rotating the cookie sheets halfway through. The cookies will be soft, but very lightly golden around the edges when done. Let them rest on the cookie sheets for 5-10 minutes, or until you can transfer them to cooling racks to cool completely. Make the glaze by whisking together the powdered sugar, orange juice, vanilla, and pinch of salt until you have a smooth glaze. Drizzle each cooled cookie lightly with the glaze and let sit until the glaze sets up, about 10-15 minutes. This recipe will yield roughly 3 dozen cookies. 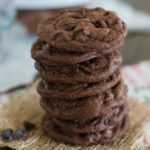 *To make these with regular flour, simply swap out the gluten-free flour for the same amount (in weight!) of all-purpose flour. Omit the milk powder and don't worry about Xanthan Gum! *I like to add dry milk powder to certain gluten-free baked goods as it helps aid in browning. Gluten-free flour blends have starch in them, which can make browning difficult. I also think it helps with softness. If you don't have any, it's perfectly fine to leave it out. If you aren't making these gluten-free, you don't need the milk powder. To freeze, I recommend portioning out the dough into balls using a cookie scoop. Place them on a baking sheet and then into the freezer. Once they are frozen solid, you can transfer them to a freezer bag. Now you can have cookies whenever the mood strikes! 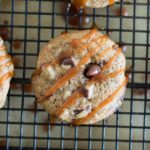 I feel like I eat a lot of cookie dough and cookies when I make them, which makes me think I’ll never make another cookie again, until the next time my cravings strike! 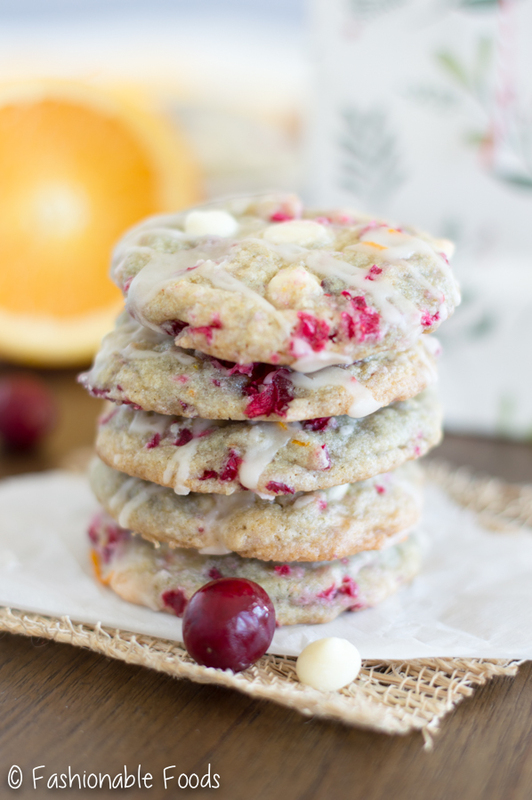 🙂 I do love white chocolate in cookies, so this cranberry version looks perfect! Love the pretty color and festive touch for the holidays. 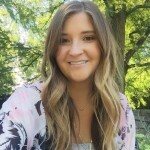 I have a feeling the cookie dough (and baked cookies) would be devoured in no time! I went through a boycott of making holiday cookies last year. Seriously I think I only made two different varieties. BUT, I’m more than making up for all that this year. I’ve been making way too many!! And what’s the acceptable amount to eat? I’m probably the wrong person to ask, because my answer is ALL of them. It is perfectly acceptable to eat them ALL. On repeat. 😉 hahaha. Not so sure my jeans will agree with me though. Anyways, these are faaabulous, girl!!!!! SO festive and pretty! 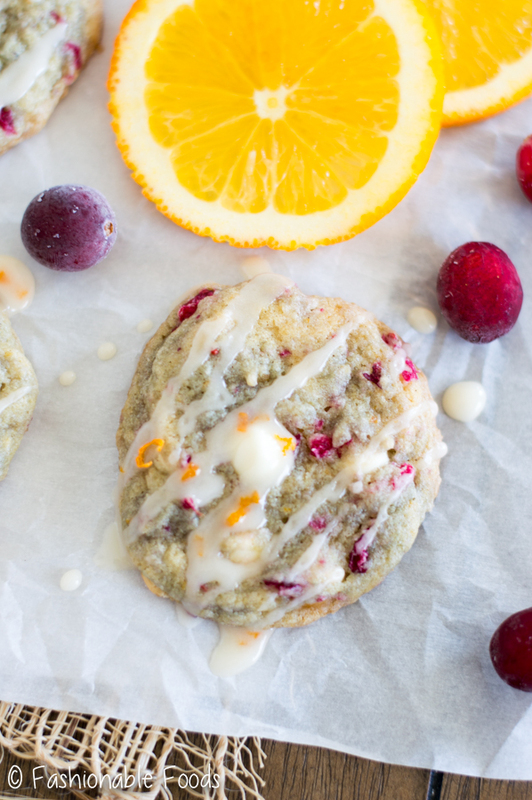 White chocolate is my jam, but combined with cranberries and that orange glaze?! DROOOOOL! I’m going to need to triple the recipe, because I could eat these beauties all day long! Pinned! Cheers! Woo hoo! I can eat them all?! 😉 Thanks for the kind words and pin, Cheyanne!